Making new television series must be harder than ever nowadays with every channel from History to Lifetime to TruTV getting into the scripted-programming game. You would think that would mean a greater possibility for experimentation and risk-taking amongst the creators of these series. But instead, TV is increasingly falling victim to the same sort blockbuster fatigue that's drowning cinema in boring, big-budget everything-to-everyone films that cost a mint and therefore can't risk appealing to anything other than each and every living soul on the planet. Shows with simple but engaging hooks seem compelled by a "more is better" philosophy intended to reach a wider audience. Don't think a show about two friends starting a restaurant is your thing? Well, what if the show added a gangster who goes by the nickname the Tooth Fairy? Or maybe had a single dad mourning his wife and is saddled with a drinking problem and an adorable kid who never talks? Maybe you'll be more likely to tune in if the show brings in an English actor to put on one of the most affected and distracting "New Yawk" accents in recent memory? Watching the first hour of Feed the Beast, AMC's newest original drama series from former Dexter and Nurse Jackie showrunner Clyde Phillips, is like being sold a Michelin star-worthy meal only to be served an incongruous pairing of caviar and pop rocks. A remake of the Danish dramedy Bankerot, the series looks like the restaurant equivalent of Halt and Catch Fire, and while it may figure out how to become that, it first must do what AMC's '80s tech drama did after an uninspiring first season: jettison any attempt to be an edgy prestige drama and just focus on doing one thing well. There're just so many inessential pieces onscreen at any given time the base element, the reason Feed the Beast could be interesting, is buried under an avalanche of disparate, clichéd components that muddle the dish to the point no one flavor is quite distinguishable. It doesn't take an extraordinary palate to pinpoint the extraneous ingredients in Feed the Beast. Featuring Friends alum David Schwimmer, who is pared with Cloud Atlas co-star Jim Sturgess, the series flirts with the notion of exploring the fickle realm of fine cuisine and restauranteering through the eyes of two friends for whom life has become a series of bad breaks and even worse decisions. People with poor decision-making or life-management skills are commonplace in television dramas and in the first hour, both Tommy Moran (Schwimmer) and Dion Patras (Sturgess) demonstrate an uncanny ability to make bad decisions and manage their lives just poorly enough that taking a huge risk and starting a restaurant becomes their only option. Characters like Tommy and Dion, with their predilections toward sorrowfulness and chaos, naturally promise a long line of potential conflicts to steer into when and if the whole "trying to start a restaurant thing" doesn't provide enough drama to make the summer series stand out amongst the never-ending cycle of new TV shows. Beyond Sturgess' aforementioned accent (or maybe because of it) he and Tommy are kind of engaging; you can see a show about these two guys trying to realize some long-held dream as having potential. Dion is every chef cliché imaginable; it's like the show spooned up all the unused parts of Anthony Bourdain and Bobby Flay, wrapped them in a grape leaf and set it to simmer. Meanwhile, Schwimmer brings the same hangdog expression that made is performance as Robert Kardashian in The People v. O.J. Simpson so much fun to watch. 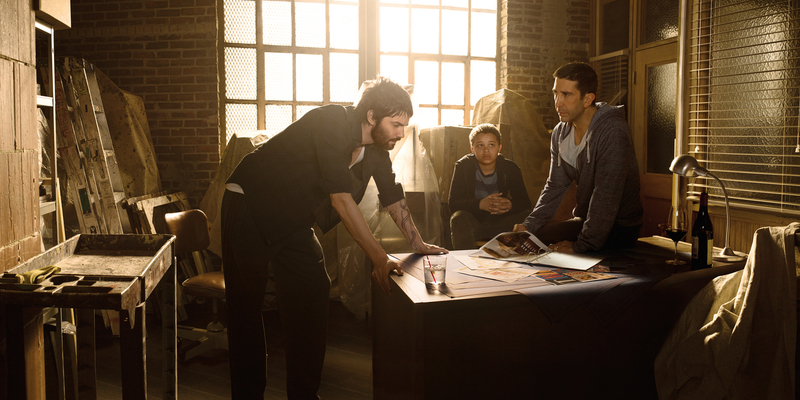 Here, with his bottomless glass of wine and T.J. (Elijah Jacob) – his child who has been speechless since his mother's untimely death a year prior – Schwimmer's ability to make mopey a valid and engaging acting choice proves itself by keeping the series firmly on the fence between drama and comedy. Where things get messy in the first hour is when Feed the Beast starts piling characters and conflict on its already full plate like free tapas at happy hour. Mad Men alum Michael Gladis' Patrick Woichik – also known as the Tooth Fairy – routinely brings the narrative to a screeching halt. There's nothing wrong Gladis or his performance per se, but the Tooth Fairy, not to mention the addition of an organized crime element, just feels like overkill. The same goes for Michael Rispoli's NYPD detective – with, you guessed it: a missing front tooth – who adds to Dion's woes and his desperation to turn his and Tommy's former restaurant dream into a life-saving reality. Throw in Tommy's racist father (John Doman, The Wire) and Feed the Beast has veritable buffet of unsavory types stewing in their own juices. And while there are enjoyable elements on display during the first episode, they all point to a single question: What's wrong with a show that is just about the world of restauranteering? Feed the Beast's most pleasurable moments are when Dion is cooking and inadvertently using that food to re-ignite Tommy's proverbial pilot light. All the other stuff – with the possible exception of Tommy's father – is extraneous. The Tooth Fairy, Dion's debt, the vengeance-filled New York cop, it all reads like plot points to single episodes rather than key elements of a burgeoning series. It's only the first hour and it's already clear how inessential those characters and threads feel. With any luck Feed the Beast will find a way to jettison them before the series becomes so mired in their inevitable complications that it continues exploring the same storyline over and over again, or it has to reboot in order to get where it needs to go. You've heard the phrase "Too many cooks spoil the soup'? Well, right now, Feed the Beast is like that but with characters instead of cooks. Clyde Phillips is a talented guy and knows how to make a show work. Here's hoping he figures out how to pare this overstuffed series down, so someone doesn't bring in Gordon Ramsay to help fix what could end up a kitchen nightmare. Feed the Beast continues next Sunday with 'In the Name of the Father' @10pm on AMC.